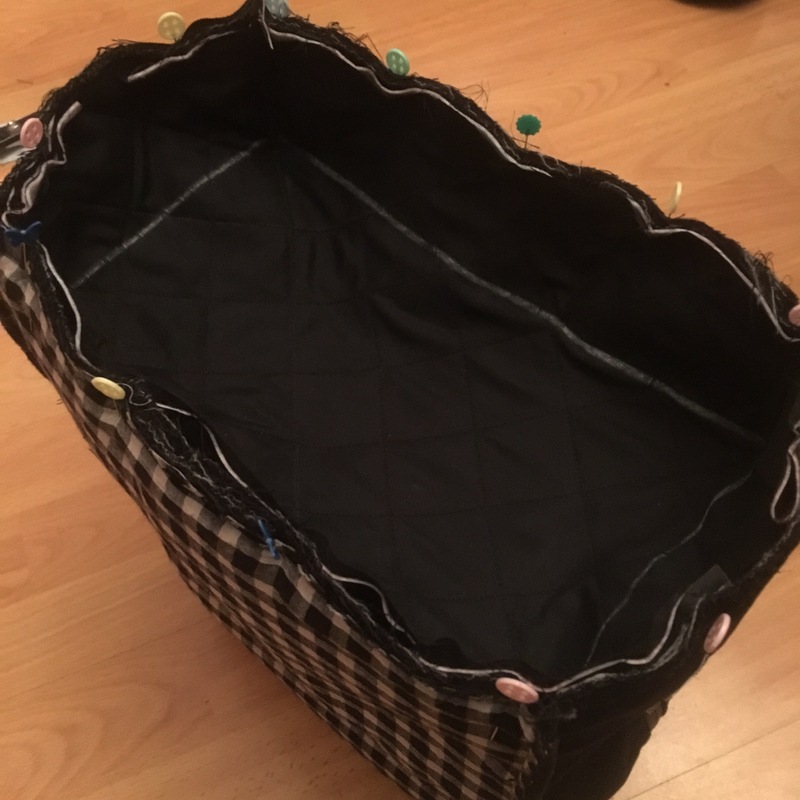 Staring at my (unfinished) list of Christmas sewing, a bit overwhelmed, I decided to make myself a bag instead! Just a bit at a time, in stolen moments. 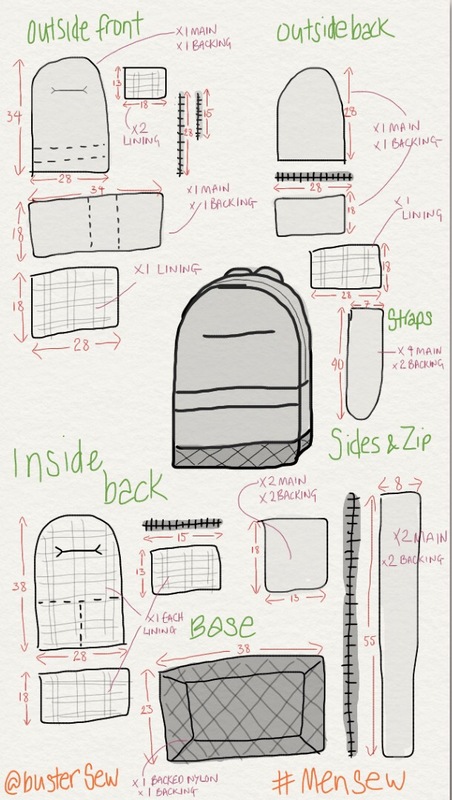 Encouraged by the success I had making MrA’s Quilted Backpack, but not wanting to ‘waste’ too much time on myself, I thought I’d keep it a bit simpler this time… also, the quilting didn’t show up on the test piece I did, so that saved a good couple of hours! … in the vague hope of keeping things simpler, I decided to not bag-out the lining, instead I opted to use my overlocker on the inside seams. Next I cut out all the pieces… So many pieces! 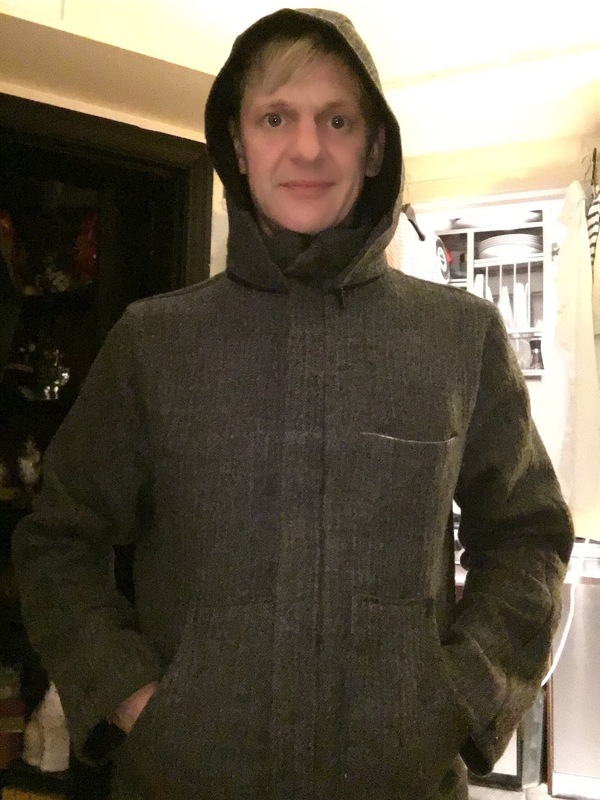 I used the gabardine to back the wool like a sew-in interfacing, giving a bit of structure and hopefully stopping it from stretching out. 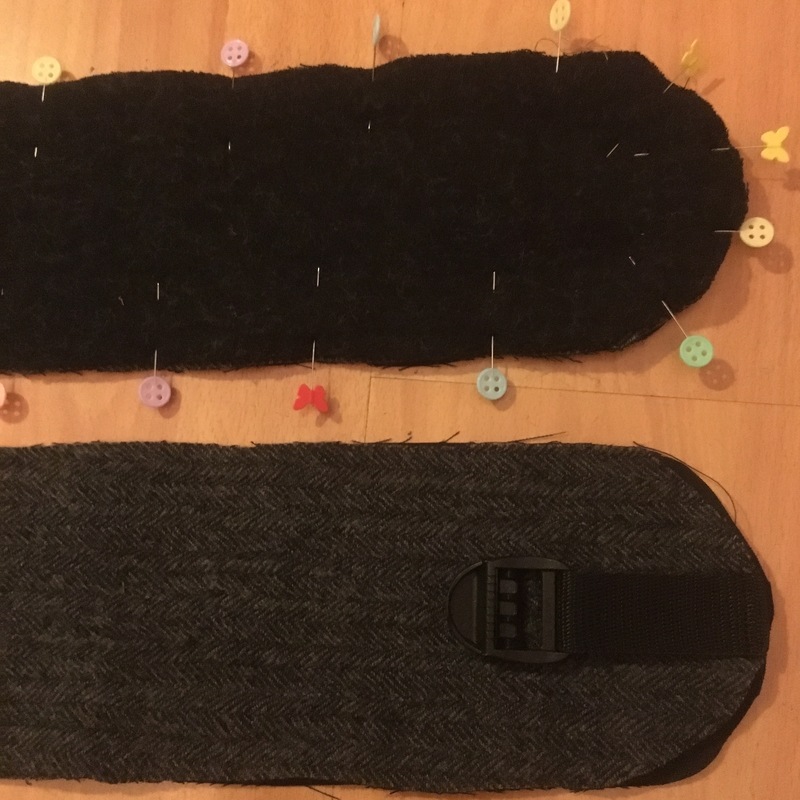 So I basted the wool & gabardine pieces together first. Next I started constructing each ‘face’. Fold the zip cover flap & attach top to bottom with the zip. 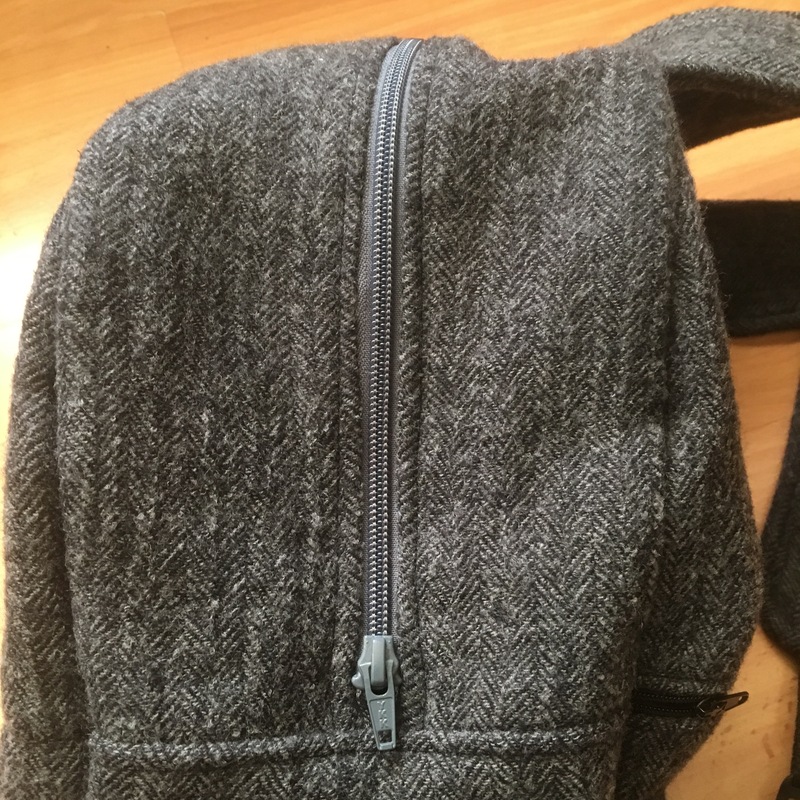 Attach the front bottom pocket lining. Cut a window out of the top. Sew on & push through the front-top-pocket linings. Position the zip & sew on. Sew up the top pocket lining. Attach top & bottom with the zip. Sew on the pocket backing. Cut out window, fold through to wrong side. Glue baste. Attach lining to zip allowance & sew up. Hem bottom pocket & stitch on. Place zip face down on right side of outer fabric. Pin. Lay lining fabric face down on top. Re-pin. 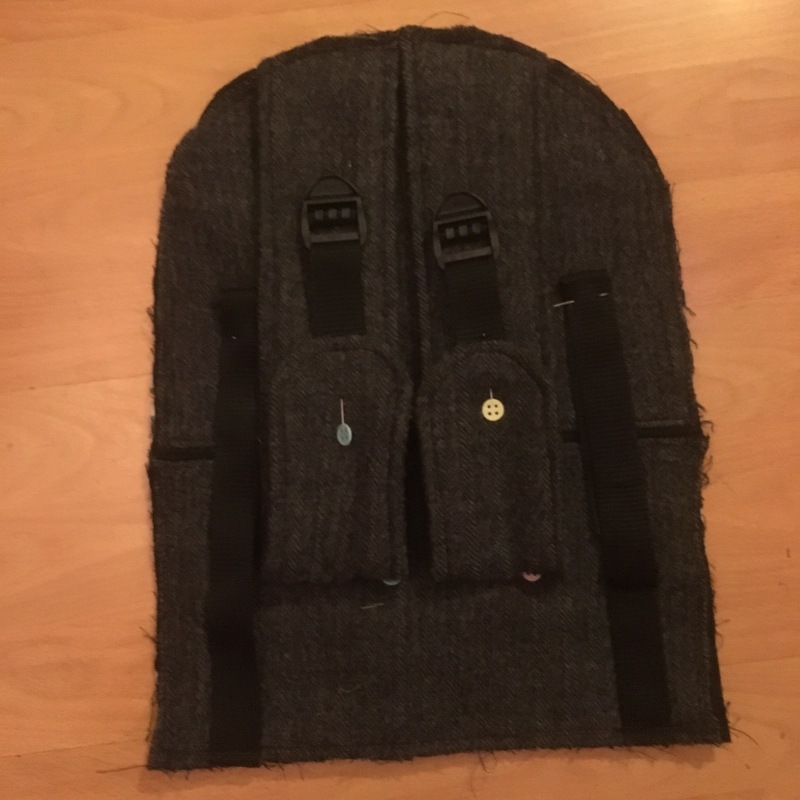 Sew all layers together with zip foot. Baste outside edges of fabric & lining together. Sew ends to sides & topstitch. Take 2 x 15cm lengths of 2.5cm webbing. Feed through the buckles. Fold the webbing in half. Lay one wool piece right side up, place webbing on the curved edge. Lay the other wool piece face down on top. 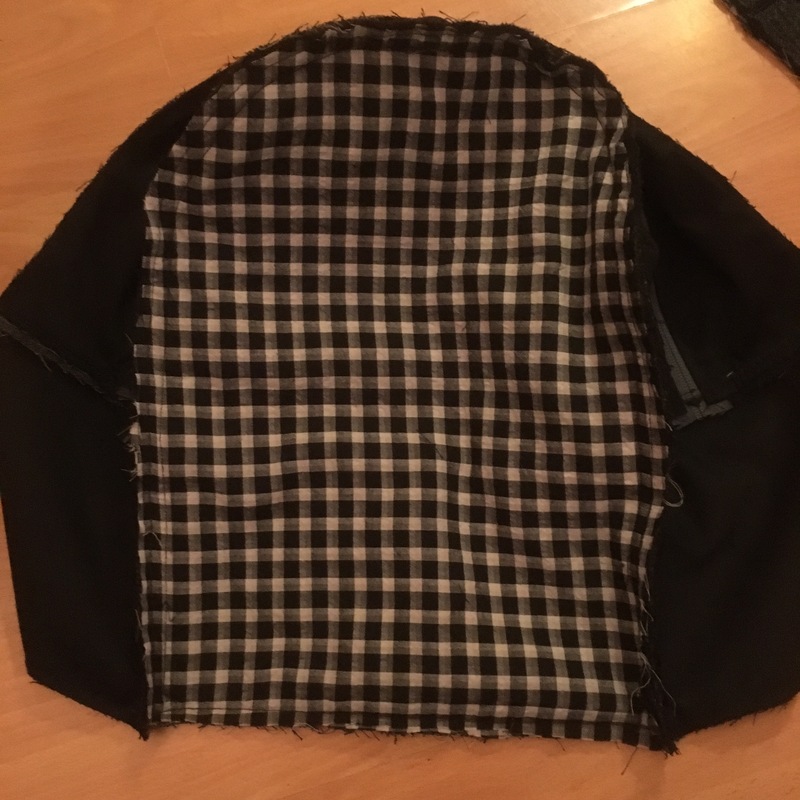 Lay gabardine lining on top. 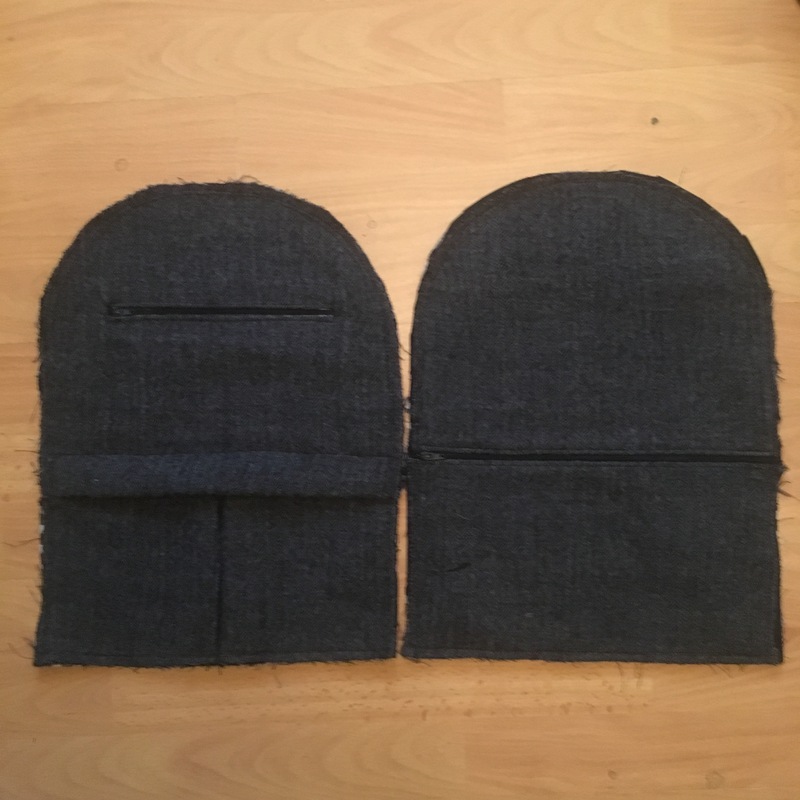 Trim curved seams & turn through. Baste straps to top edge of outside back piece. Then it was time to put it all together. I marked the centre top of the main bag pieces & the halfway mark on the zip piece. I matched the seams at the sides with the front pocket flap seam and pinned all the way round. It was a bit tough sewing through the thickness at the straps, but, taking things slowly, I got through it. 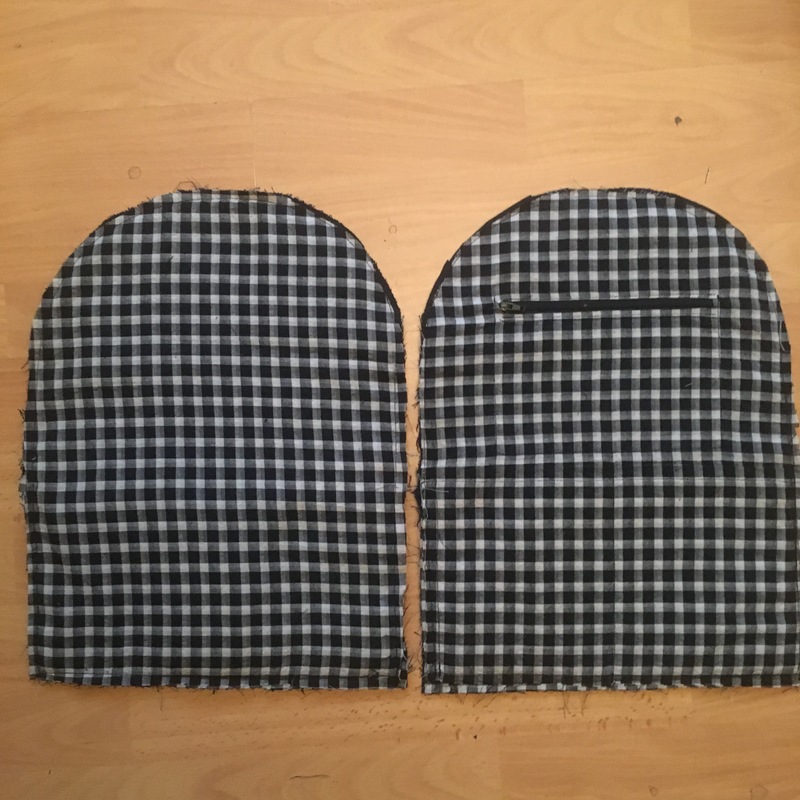 My overlocker struggled a bit more, so rather than using the cutter, I trimmed down the seam allowance and tried again. I broke four needles, but eventually got round. I had a big enough scrap of fleece backed nylon in my stash, so used that for the base. 3.5cm spacing, quilted to gabardine. Mark base size, sewing line & diagonals at the corners. Pinch up corners & sew to make a ‘tray’. You could cut the corners off, but I basted them to the sides for a bit of extra support. Baste 2 x 25cm webbing to outside bottom bag piece, about 3cm from the outside bottom edge. Match corners and pin base (right sides together) inside the base of the bag. Sew the base on & overlock the seams. Turn it through and… hey presto! A bag! … and it makes a terrific racket. 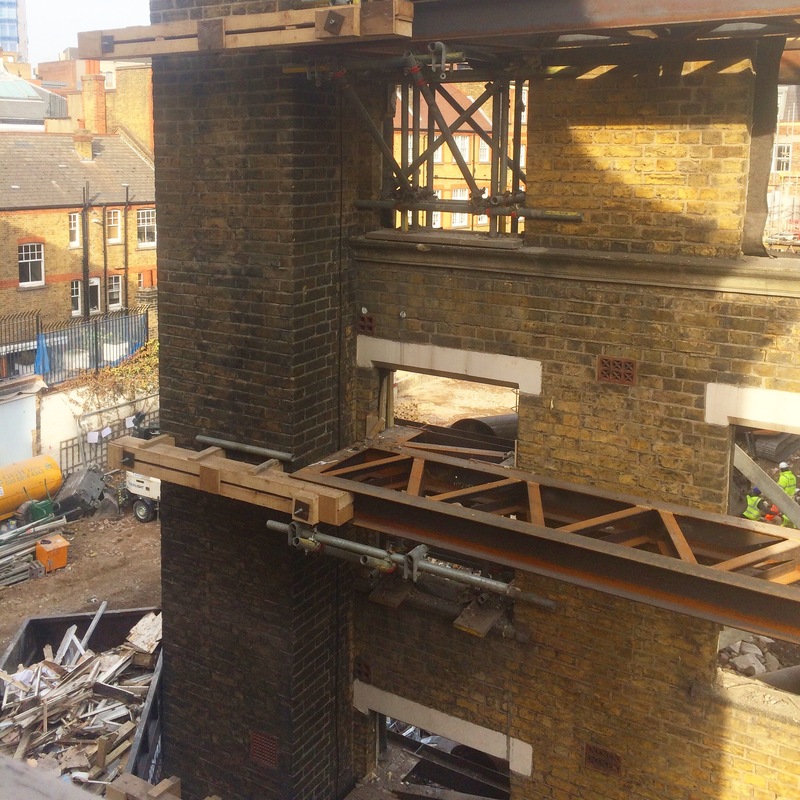 So, to allow us some respite, our very dear friends LadyE & SiPi have lent us the keys to their London ‘pad’ in Acton. The delicious pub dinner, peaceful nights sleep, lazy lie-in & views of trees did just the job, soothing our frazzled nerves. We’re lucky to have such good friends (with such a beautiful, peaceful, mostly empty house). 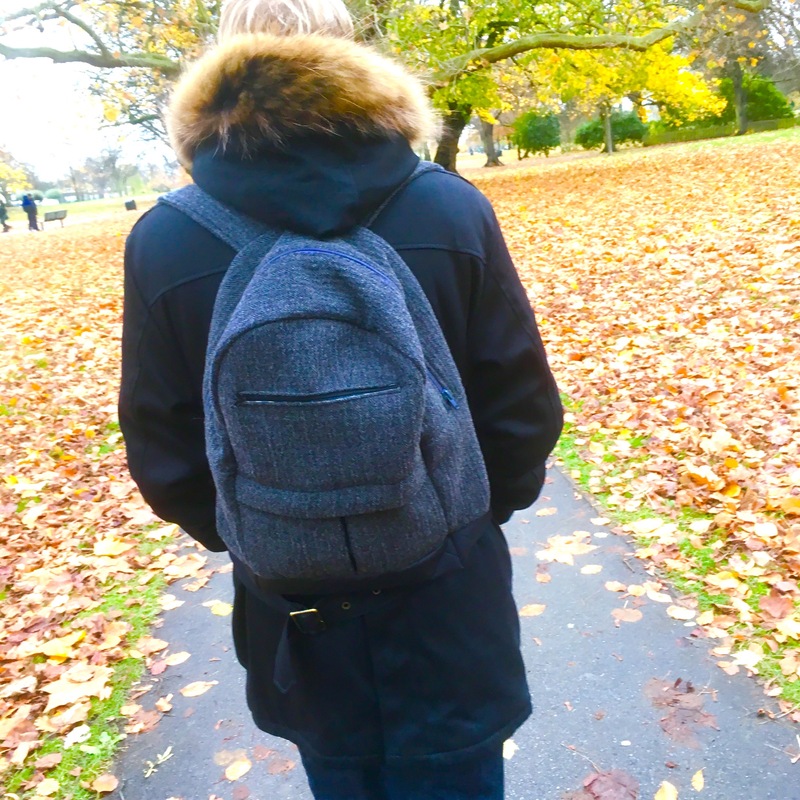 Adding to the joy, my new rucksack got its first outing…! Don’t overstretch the capabilities of your machines! Get all the bits needed before starting. Thank you! I must admit, I’m really happy with it… I usually hate carrying bags, but now I’m taking this with me everywhere!